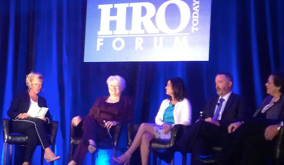 A year whizzed by since I last attended the HRO Today Forum in Philadelphia. What was new this year? The location (The Westin) and month (May) were the same, and certainly lots of familiar faces, but the content was fresh with great keynotes and a ton of plenary tracks for specialists looking to really dig into hot HR topics and learn about HR Tech. This year was lively as ever thanks to the ever present wisecrack remarks by the MC Mr. Elliot Clark, CEO of SharedXpertise and a fantastic lineup of speakers totally jazzed about their topics. The most impressive new item on the billing was the first formal Blog Squad, headed up by yours truly! Missed the micro-blog bliss cranked out by the illustrious Matt Charney, or the on point observations penned by George LaRoque (check out his awesome recaps One and Two). Not to worry, we’ve got you covered with highlights republished here for your enjoyment…. Or you can scroll away through the Twitter feed. Also blogging her brain out was Kara Yarnot who wrote an excellent blog about the event. Tweeting cameos from Joel Cheesman and Debbie Bolla rounded out a great Squad! Of course the King of Retweets, Aki Kakko, performed his royal duties from afar (Lithuania) granting speakers and sponsors with exposure to his 34,000 followers to read about their captured nuggets of wisdom. With over 300 senior level HR executives and HR thought leaders in Philly for learning and sharing, the halls buzzed with chatter about the latest techniques or technology. Since most were director and above, much of it centered on strategy and business value – quite different than your average SHRM event. One of the first panels that I attended was the panel on Health Care Workforce Track: Overcoming Talent Shortages. This panel talked about five ways to tell a company that they may need to come up with a new and creative way of finding healthcare workers. A really exciting and entertaining event that happened later on was the discussion by Ethan Mollick, Professor of Management at Warton School. He discussed about games in HR and whether it could be used seriously or if it was “chocolate covered broccoli.” His talk was interactive because he had the audience start the session by playing a game like Angry Birds. It is not everyday I get asked to play games at an HR conference! Mollick stated that over 11 billion hours of Angry Birds have been played and that this amount of time is enough to build the Panama Canal every day. At the end of the HROToday forum there was the iTalent competition for technology innovators. This year’s competition focused on talent. Six vendors had seven minutes to pitch their ideas to a panel of judges. Every presentation was great and had I been a judge it would have been really hard to pick my top three. After the judges and audience voted, a winner was decided and this year’s winner was Universum Global. Their product is called Iris – a social listening and measurement tool that has been tailored for the HR and Talent industry. Runners up were SkillSurvey, Jibe, Greenhouse, Clinch and TalentObjects by Lumesse. The talks and discussions were amazing and had been very eye opening. It makes me wonder where the HR world will be when this conference rolls into town again next year… until then be sure to follow @HRTechAdvisor for insights gleaned from other HR conferences from around the globe.